1.) At what age did you first become interested in baseball? Did you always want to be a pitcher? I was interested in baseball as soon as I started playing tee ball at age 4. I knew I wanted to play it my whole life. I didn’t always want to be a pitcher. As a kid I grew up watching the Yankees and following Derek Jeter, so I wanted to take his place at SS for the Yankees, haha. 2.) Coming out of high school you were drafted by the Texas Rangers. What made you decide to go to college instead of going pro? Why LSU? I knew I wanted to go to college for a while, especially at LSU. Even though I wanted to start my pro career as soon as possible, I wanted to get a jump start on my education, play at one of the best college programs in the nation, and compete for a national championship. I decided to go to school there because of the fans and tradition. The great things I heard about those thing combined with the reputation of the LSU coaching staff sold me. 3.) What’s the most memorable moment of your College baseball career? Easily the most memorable moment was winning the national championship and starting the final game of the World Series. 4.) What was draft night like? Where were you when you found out? Initial thoughts? Funny story. We actually ended our season the night before and were traveling all day from California to Louisiana. So I actually found out on the plane when we landed. Even though I had a pretty good idea that it was going to happen somewhat like it did. 5.) This past year was your first season of pro ball. What do you think went well, and what do you feel you need to work on for 2012? 2011 was a bit of roller coaster for me in my results, but I think I did a great job of getting into routines and staying healthy the whole year. That was my biggest goal, to stay healthy and make all my starts, and I did that. I need to work on more stamina and consistency this year so I can have a better outing more often instead of going back and forth between bad starts and really good ones. 6.) Favorite sport(s) besides baseball? Basketball actually is my first love. I grew up playing it my whole life and played through high school and almost played in college. I decided to go to a big school for baseball rather than a smaller one to play both. I decided to focus all my energy and attention on baseball hoping to make a professional career out of it. Favorite food has to be my mom’s home made pasta dishes. Coming from an Italian family I love Italian food and the combination of homemade food and Italian makes me crazy for it. Pro baseball has actually gotten me into a lot of TV shows. Loved watching Dexter, Lost, Nip/Tuck, East Bound and Down, and Californication. If you put any of them on TV I will probably pick them over almost anything. 9.) What advice would you give to kids, that are just starting out, who dream of becoming a pro ballplayer one day? Advice for kids growing up playing ball and dream of it being their future? Have fun while you’re a kid and enjoy playing. Play other sports to keep busy and athletic, and when it comes to elementary school and high school, work as hard as you can so you can play the game you love for the rest of your life. Big thanks to Anthony Ranaudo for taking the time to answer my questions. 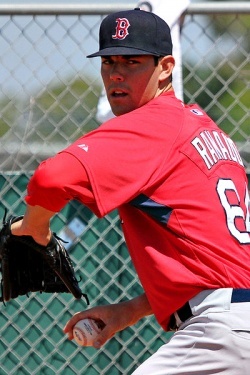 This entry was posted in Dailies and tagged AL, Anthony Ranaudo, MLB, Q and A, Red Sox by Matt Huddleston. Bookmark the permalink.